How do we identify the sub-processes? 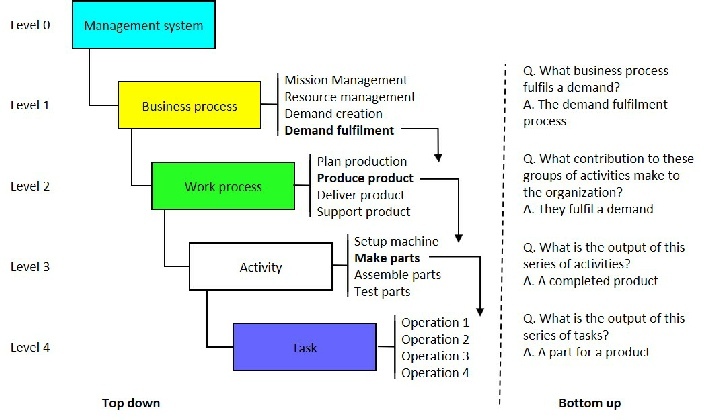 The processes identified in the system or organization model can be regarded as Level 0 implying there are further levels in a hierarchy as shown above. Here we also show the connectivity between levels using both a top down approach and a bottom up approach. It is important to remember that the purpose of any process is to achieve an objective and therefore whether the objective is strategic such as a vision or mission, or is related to the completion of task such as crossing the road, there is still a process to achieve it. However, if the decomposition reaches a level where to go any further in the hierarchy you would be in danger of noting arm movements, you have gone a level too far. Ask what factors affect our ability to deliver these outputs or achieve these objectives. E.g if innovation is critical there ought be an innovation process. Ask “where does this output go to” and thereby identify the next Stage in the process.